Eight students, one goal: be a force for good. What sounds like a highly seized motivational phrase became a real goal for the group of LUMS students who attended the World Business Council for Sustainable Development’s (WBCSD) liaison delegate meeting in Switzerland. Around 500 Sustainability Leaders attended the meeting to discuss how to channel the ever growing will to move towards low-carbon technology development and scale up deployment with the aim of the Low Carbon Technology Partnerships initiative (LCTPi) to limit global warming to below 2°C which was supported by the outcomes of the COP21 conference hosted by France at the end of last year. The WBCSD holds two annual meetings. The first of these is the council member meeting in autumn (such as the meeting in Paris 2015) and the second is the liaison delegate meeting in spring, which eight Lancaster students attended in Montreux this time around. During the liaison delegates meeting the WBCSD aims to develop new strategies and new collaborations to work towards the sustainable development goals (SDG’s) that were set in the more public council member meeting. Most of the working sessions and discussions at the liaison delegates meeting were not open to the public, and so the students were honoured to be a part of this event, under guidance of Dr Alison Stowell (Department of Organisation, Work and Technology, Lancaster University). The students were able to take an active part in the process, hear first-hand views of experts from industry, thereby witnessing ideas put into action. Plus having the chance to network with business leaders from companies such as Santander, IKEA, Unilever, BT, Deliotte, BCG and KPMG, and thus act as an ambassador for the University and Management School. 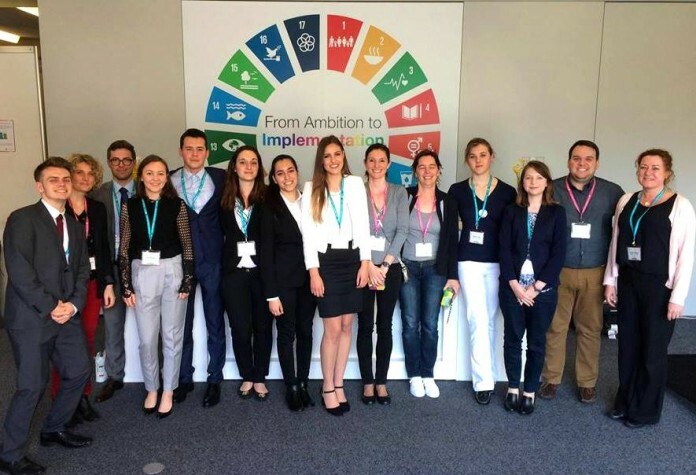 Similar to the students who attended the Council meeting in Paris in 2015, the participants of this trip had to enter a competition to get a place in the group and needed to provide a business related background of their studies. For fellow participant Ferdinand Weiler and myself (both Euro BBA students), we both took part in the previous Paris conference at the end of last year and the Montreux meeting served as a practical extension of what we observed in Paris: “one of the highlights for me personally was seeing the puzzle pieces coming together. After having participated in the Paris summit I felt like the conference left quite a few implementation issues untouched. Montreux was more practical orientated and therefore provided the means to resolve those issues” says Ferdinand. For me, Montreux provided my fellow students and I with the necessary action plans and implementation strategies to complete the goals set in Paris. For those team members who had attended such a meeting for the first time, seeing the actual work being done in sustainability working sessions gave them a great opportunity and outlook for their future career. So Rachele Lanza (BSc. Marketing Management) utilised the opportunity to observe “how a global council/platform like the WBCSD operates, the reach it can achieve and in particular, I would say that the most valuable aspect for me was to have the chance to listen, at least partially, to the kind of conversations businesses get involved in when it comes to sustainability”, Dafni Papaioannou (BBA Management) also remarked that the “opportunity to attend the working group session on sustainable lifestyles had a great impact on how I perceive the business world and made me change my own views on several topics”. Especially those students who attended a WBCSD meeting for the first time also felt that this experience made them even more aware of what needs and can be done to make our world more sustainable; Rachele, who has been and is still sceptical about the approach business will take in this matter, changed her view: “I had always thought of sustainability more either like an underlying value or more like a practice, never as an actual way of living and running a business– I guess this is an interesting new angle on the whole sustainability matter for me” while Thea and Dafni also observed the complexity of environmental, social and economic challenges and mentioned they wished to have even more chances as an consumer themselves / provide more chances as business leader, to actively take part and contribute to this change for good. The Montreux meeting also presented an excellent career opportunity for the eight students. Ferdinand and Thea Nygård (BSc Management and Organisation/ HRM) saw an improvement in their networking skills and the ability to feel comfortable in a business environment. Lee Brennan (BBA Management) says: “never before had I been at such a high profile event with many professionals and business representatives – observing how people socialized and communicated with each other gives me a precedent on how to behave in such professional situations in my future career. I managed to speak to a few participants too, and have gained insights into their respective companies and the progress of sustainability”. All of the 8 students had the feeling that this experience reinforced their career aspirations and gave them the chance to get different perspectives on several challenges and opportunities. Isabella Trapani (Euro BBA) had positive feelings regarding the effect for her career: “Attending the conference and especially speaking to other attendees has clearly helped me to define my career goals. It was very motivating to meet people who are creating change in businesses and hear about their experiences”.